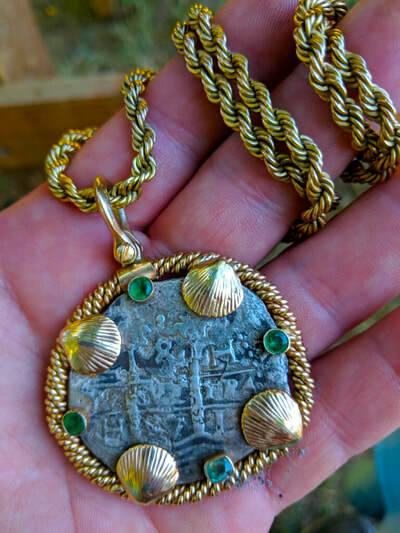 PENDANT 1697 PERU 8 REALES PIRATE GOLD TREASURE SILVER COIN & EMERALDS JEWELRY This beautiful well crafted Shipwreck coin struck in PERU 1697 8 Reales weighs approx 23gm, coin only. The GOLD weight for the Bezel and Clasp (Bail) weighs 17.5gm of 14kt Gold. The Emeralds weighs a total of .75ct (.25 each), and .37cw for the bottom stone “arstinite). The twisted rope and Sea Shells are 14kt. You can also purchase the Chain as well for a total of $4950 both Chain and Pendant. The Cob Mint is struck “L” LIMA and Assayer “H” Hurtado. This piece is “Doubled Dated” below the Cross. 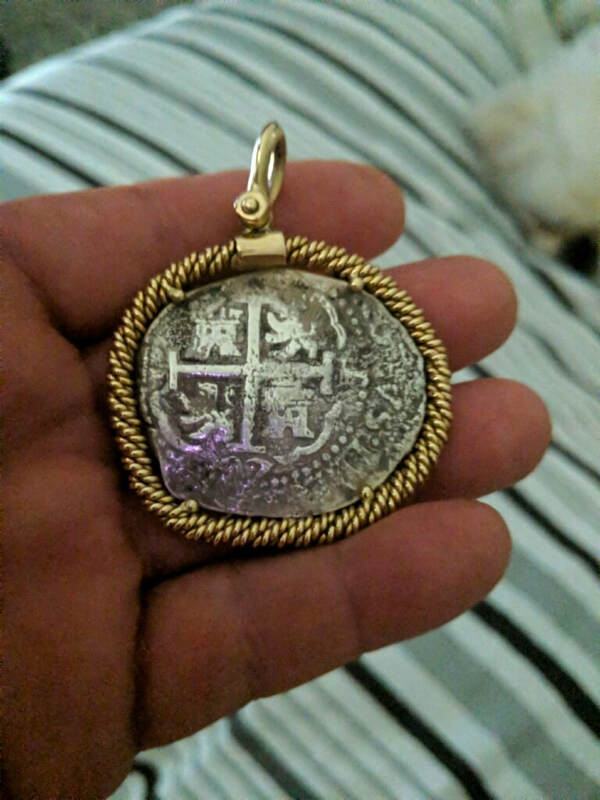 The CROSS is Fully Struck as well as Full Castles and Lions even the Legends are visible, the King’s Ordinal “Philipus.” This is such a beautiful piece of Treasure Jewelry.